← What Does Conservative Theatre Look Like? Williams was a Modernist poet, who dabbled in Imagism to craft poems of daily life and small details. Modernism aimed to be a stylistic break from Victorian-era sentimentality and melodrama. You can see this lack of sentimentality in “This is Just to Say” – the poem acknowledges a minor theft (possibly by Williams’ wife) in a household without apology. The speaker (or writer of the note, as many interpret the text) asks for forgiveness, but does not apologize for eating the set aside fruit, for “they were delicious.” Thus, the Modernist tendency of uncovering emotional truth without excess sentiment is clear in this poem. But why has it become a Twitter joke? This blog won’t go into the history of the meme, who started, etc. That’s for more effective social media anthropologists to do. I’m more interested in why this particular poem, and what creativity has resulted. Screenshots ahead! Jonny Sun, everyone’s favorite Twitter alien, is perhaps the most prolific of plum-meme writing. The tweet to the left takes the topic of the poem and sets it in the rhythm of the oft-parodied rap structure of “my name is____ and I’m here to say.” This reimagining of the poem centers the poet as both the speaker and braggart, true to hip hop form, and eliminates the speaker’s request for forgiveness. Other tweets set the poem to particular music cues that must be inferred by the reader. User @logicbutton has set the topic of the poem within the lyrics of Tears for Fears’ “Mad World,” a song noted for its melancholy rumination on life and death. Instead of a boastful speaker, as in the above example, this tweet finds the sadness in the speaker denying the plums to someone else, while still keeping some sense of apologia. 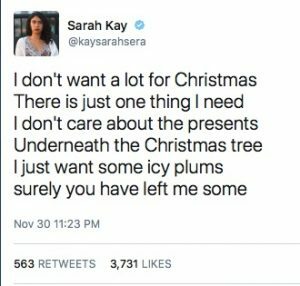 The next tweet, by user @kaysarahsera, is a seasonal offering, setting the poem’s topic within the structure of “All I Want for Christmas is You,” the classic holiday song by Mariah Carey. In this twist, the speaker is the person anticipating the plums, rather than the one who ate them out of turn. 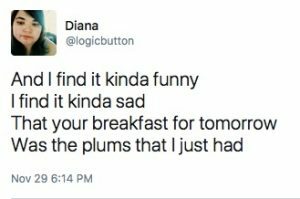 This takes the perspective of the poem and adjusts it slightly: the singer only wants the plums, and seems to expect them, but because we know what happens in the original poem, we know they will never get that fruit. This tweet, even mores than the others, requires a foreknowledge of both the original poem, the Carey song, and the sense of longing evoked in both texts. It’s really quite complex in its construction. 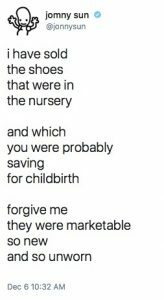 Returning to @jonnysun, he started to combine Williams’ poem with what might be the prototype for all twitter fiction; the “baby shoes” story, usually attributed to Ernest Hemingway. Clocking in at six words, “for sale: baby shoes, never worn” is perhaps the most effective example of flash fiction, regardless of who originated it. It is at once emotional and clever, something much of Twitter aspires to be. Here, he takes the structure of “This is Just to Say” and uses the baby shoes as the topic, but creates something that is a harsh critique of capitalism. 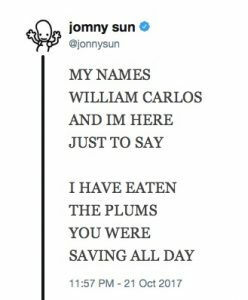 Earlier that same day, @jonnysun tweeted a more direct version of the later poem: the structure of “baby shoes,” with the plums as topic. This might be the apex of both the meme itself and twitter literary creativity, smashing two concepts together and maintaining the short form Twitter is known for. I can’t say I know for sure how William Carlos Williams would feel about this, but as a Modernist, he surely was invested in what was “new” in self-expression and poetry. These lighthearted commentaries on his work move the poem into the postmodern space, where mixing, collage, and remixing serve to create even “newer” ideas and poems that can be enjoyed on many levels. As a literature professor, it makes me so happy to see folks even discussing poetry, let alone writing and re-writing it for different audiences. 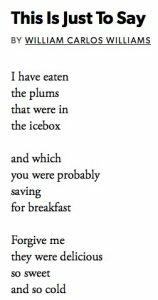 This entry was posted in Academia, Pop Culture and tagged plums, poetry, twitter, william carlos williams. Bookmark the permalink.